Last Sunday was a special day in the history of Durban’s excellent Baroque 2000 ensemble. The celebration of 20 years of entertaining audiences with their wonderful performances of baroque music. And what a spectacular and festive event it turned out to be. The Mariannhill Monastery Church was filled nearly to capacity with an appreciative audience, the musicians and singers were on top form, the programme presented an exciting and joyous selection of music, and to top it all, tea and cake was served in the Cloisters at the Monastery after the concert. It was certainly a jubilant and memorable occasion. The main item on the programme was Marc-Antoine Charpentier’s (1643–1704) brilliant Te Deum. This ‘Song of The Church’ featured soloists Elsabe Richter (soprano), Lente Louw (mezzo-soprano), Monika Voysey (mezzo-soprano), Willem Bester (tenor) and Keaton Manwaring (bass), along with the Durban Chamber Choir and members of the Odeion Singers. They were backed by an enhanced Baroque 2000 ensemble which included oboes, flutes, trumpet, bassoon and percussion along with the usual strings and harpsichord. The conductor was Lance Phillip from the Odeion School of Music at the University of the Free State. The ceremonial and dramatic Overture from Charpentier’s Te Deum, which is popularly used as a wedding march, sets the tone for this magnificent work. It is powerful, melodious and colourful and it was performed with superb skill and elegance by the ensemble and singers alike. It served as a fitting commemoration of Baroque 2000’s 20th anniversary. The first part of the programme took the audience on a visit to the Palace of Versailles for a selection of music from French composer Jean-Philippe Rameau (1683-1764), who was a court composer for Louis XIV. Rameau was one of the most important composers and music theorists of the baroque era. He was celebrated for his innovative and popular operas, and this was the source of the musical pieces performed by the Baroque 2000 ensemble. It was a delightful selection which offered everything from the grand and imposing sounds of the Overture from the opera-ballet Zaïs to the gentle and delicate flutes of Air tendre pour les Muses from Le Temple de la Glorie. In all, six operas were represented with the Chaconne and Dance des Sauvages from Les Indes Galantes providing high points with plenty of colour and dramatic percussion and trumpet sounds. 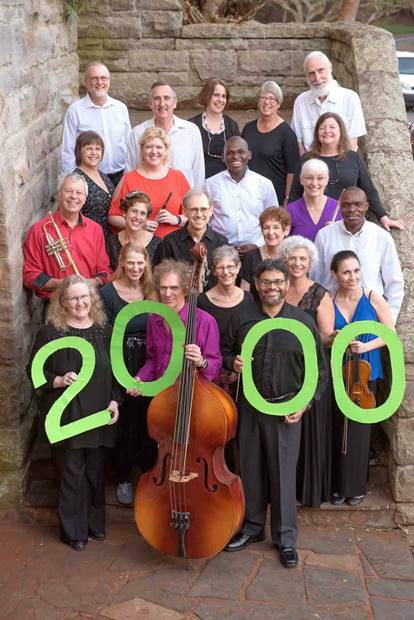 Baroque 2000 plays a very important role in Durban’s musical life. It is of great credit to the musicians and their director, Michel Schneuwly, as well as their main sponsor, Die Rupert Musiekstigting, that they have achieved this significant milestone. Congratulations to all - and may there be many more anniversaries! The next Baroque 2000 concert will take place at the Mariannhill Monastery Church on November 19 at 15h00. It will feature the Drakensberg Boys Choir in Vivaldi’s Gloria.